You can help out the environment by bringing a travel mug to your favorite coffee shop and having the mug filled instead of a paper cup. If you need a cup of coffee to get going in the morning, you can save plenty of money by brewing your own and bringing it with you to the office, school, or wherever you need to go. But that requires having a good travel mug to keep your coffee hot no matter how long your commute. Travel mugs aren't just for keeping beverages hot, though. They can keep iced coffee cold, too--as long as you choose the right one. That means knowing what material, capacity, insulation, and other features best suit your on-the-go beverage needs. Our shopping guide has all the information you need to find the ideal travel mug for your next commute, including product recommendations for our favorite mugs. Travel mugs are made from a few different materials. Plastic mugs are the most budget-friendly, though they can stain and soak up odors easily. Stainless steel is a popular option for travel mugs because it retains heat well and doesn't absorb stains or odors as easily as plastic. There are also some glass and ceramic travel mugs, but they aren't as durable as plastic or stainless-steel options. Keep in mind that stainless steel isn't microwave-safe, so if you want to be able to reheat beverages in your mug, you're better off with plastic, glass, or ceramic. Travel mugs vary in size from smaller mugs that hold as little as 10 ounces to oversized models that hold as much as 30 ounces. The best capacity for a mug is obviously a matter of personal preference, but consider how much coffee or tea you usually drink. A 10-ounce mug holds about a single cup of coffee, while a 30-ounce mug holds approximately three to four cups. If you drink in your car, make sure the mug will fit the cup holders snugly so it won't tip over and spill inside your vehicle. Check the diameter so you can be sure it will fit. To keep beverages hot--or cold--all day, a travel mug should feature some type of insulation. Lower-end options often don't, though, so it's important to check the product specifications to see whether the mug is insulated. Some manufacturers clearly state how long a mug will maintain a beverage's temperature to give you a better idea of the effectiveness of the insulation. Most travel mugs have a fairly streamlined design, so they don't feature a handle. The exterior doesn't get hot if the mug is properly insulated, which means you don't need a handle to protect your hand. But you may find it easier to maintain a grip on your travel mug when you're on the go if there's a convenient handle. You don't want your coffee or tea spilling all over the place, so choose a travel mug that features a leak-proof seal to keep liquids from seeping out. Some even have a locking lid, which allows you to toss the mug in your bag without worrying about it opening and damaging your belongings. When you're driving, it helps to be able to drink from your travel mug with one hand. That's why a model that doesn't require you to remove the lid to sip is usually the best option. With some mugs, you push a single button to open the lid and drink, so you don't need to take your hands off the steering wheel. You'll want to keep your travel mug clean and ready to go for daily use, so you'll probably find that a dishwasher-safe model is the best option. If you choose a mug that requires hand-washing, check that the opening is wide enough to make cleaning easy. Travel mugs usually range from $10 to $30. Mugs that are under $10 are usually made of flimsy plastic and don't have much insulation. You can get a quality mug with average insulation for about $10 to $15. Travel mugs that run from $15 to $30 are usually made of stainless steel, very well-insulated, and easy to drink from with one hand. Q. What travel mug material makes for the best-tasting coffee or tea? A. Many users find that their beverages taste best in a stainless-steel travel mug. That's because plastic can absorb the flavors from previous beverages and give your current drink a stale taste. Q. What type of travel mug is the most durable? A. Both plastic and stainless-steel mugs are very durable and hold up to the wear and tear of daily commuting well. Ceramic or glass mugs, on the other hand, are pretty fragile, so you must be careful when you're traveling with one. 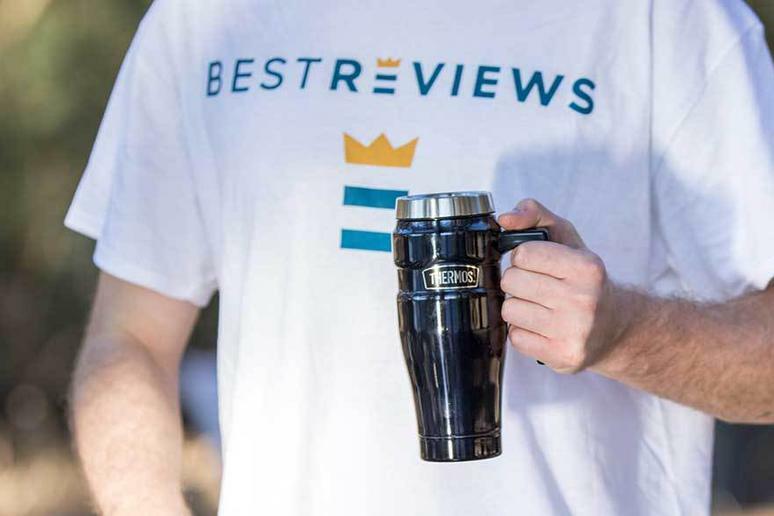 Our take: An outstanding travel mug with plenty of features for added convenience. What we like: This mug boasts vacuum insulation to maintain beverage temperature for several hours. It features a tea hook for easy brewing. It doesn't contain any BPA. What we dislike: The handle can feel somewhat flimsy and isn't very comfortable to hold. It's more expensive than other options. Our take: A travel mug that's big on durability and comes at a very affordable price. What we like: It features double-walled stainless-steel construction for added durability. The tapered bottom fits most cup holders. It doesn't contain any BPA. What we dislike: This mug must be hand-washed. Our take: An excellent travel mug that's well-designed and boasts plenty of impressive features. What we like: Thermalock insulation effectively maintains beverage temperature. The autoseal lid means you don't have to worry about spills. It doesn't contain any BPA. What we dislike: It's handle-less.